It’s late 1973, and Vinegar Joe singer Elkie Brooks is walking home to her flat in Fulham. She’s halfway down the alleyway that leads from Putney Bridge underground station to the New King’s Road, when a man steps out of the shadows. …Except it was all a scam, a mock street crime designed to drum up publicity. Vinegar Joe were the first band this writer ever saw live, in the exotic environs of Slough Community Centre. They made quite an impression. Elkie Brooks – belying her present-day, soft-focus MOR image – was raunch’n’roll personified, a thigh-thrustin’ hybrid of Janis Joplin and Tina Turner. Robert Palmer was, by contrast, the ultra-coolest of cats. A smooth operator who sashayed around barely breaking a sweat while his bandmate stomped, shrieked and hollered like a she-devil. Brooks and Palmer were polar opposites but their onstage relationship was pure dynamite. Yin, yang, thank you, ma’am. Palmer sported a tousled mop of short blond hair and stylish attire that plainly wasn’t bought at Kensington Market. 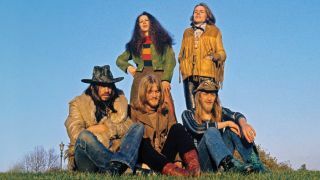 He was more Paco Rabanne than patchouli oil – which most certainly couldn’t be said of Vinegar Joe’s other male musicians, led by six-stringer Gage. They were craggy hippies in scoop-necks and loon-pants who cranked out R&B so rough-edged you could sand floors with it. With Palmer in tow, Dada departed for the States to play a series of dates supporting Iron Butterfly. Behind the scenes, however, Atlantic Records supremo Ahmet Ertegun had decided the multi-membered Dada was financially unviable and too much of a drain on his label’s coffers. “We were told to drop the brass section, trim the frontline and get more rock-oriented,” says Gage. Dada bassist Steve York – soon to be part of the fledgling Vinegar Joe – recalls being summoned to a meeting at London’s Hilton Hyde Park Hotel. Moreover, Blackwell wasn’t keen on Elkie Brooks being part of Ertegun’s proposed new band. “We all had a lot of studio experience and we might have been too inclined to polish everything,” opines York. “Our efforts in the studio were fine but the production should have had more commitment,” claims Gage. “Vic Coppersmith-Heaven [aka Vic Smith, producer of The Jam] was given the job for our first two most crucial albums. I remember him getting me to smoke raw opium through a Coca-Cola can before attempting a mandolin solo – an experience I would never choose to repeat. On a more positive note, “Elkie was being really acclaimed and we were constantly gigging,” says Gage. Sometimes the simmering rivalry between Brooks and Palmer threatened to boil over. Many fans were convinced Brooks and Palmer were an item, a smouldering photo session of the pair by Gerard Mankowitz adding fuel to that particular fire. But Palmer might have had a point, as Brooks makes mention of an earlier live review by “a creep from the Melody Maker” that referenced the sorry state of her armpits during a typically steamy on-stage performance. How far could Vinegar Joe have progressed if Palmer had stayed? Palmer released his debut album, Sneakin’ Sally Through The Alley, in September 1974, kicking off a hugely successful solo career. Ten years later – despite his reputation for not being a ‘band person’ – he joined supergroup the Power Station, made up of members of Duran Duran and Chic. “Robert was a predator and Duran Duran were hot,” says Gage. “Working with them had advantages for him. Plus he got to work with his New York buddies, Bernard Edwards and Nile Rodgers [of Chic]. If Palmer had lived – he died of a heart attack in September 2003, aged just 54 – could there ever have been a Vinegar Joe reunion? “No way,” says Gage bluntly. “I would think the chance of Vinegar Joe re-forming if Robert was alive would be nil, considering Elkie has carved out a career in a completely different genre,” says Deacon.